Vantage Point is a family of products that allows you to retrieve environmental information from a variety of smart devices and then display that information in a way that is meaningful to your company or clients. For example a large university might want to hold a competition among its dorms to see which dorm can consume the least amount of power in a month. Using Vantage Point, the university could display both the daily and cumulative power usage for each building in the competition. Or perhaps your company has instituted an energy savings plan, you could use Vantage Point to show off just how much energy your company is saving. Maybe you just want to see office by office who forgot to turn off their lights at the end of the day. With Vantage Point, you can do all this and more. The Vantage Point family is made up of multiple products that can run on a single computer or multiple machines. The Vantage Point Server retrieves and stores information from a variety of smart devices, such as thermostats, light switches, motion sensors, etc. 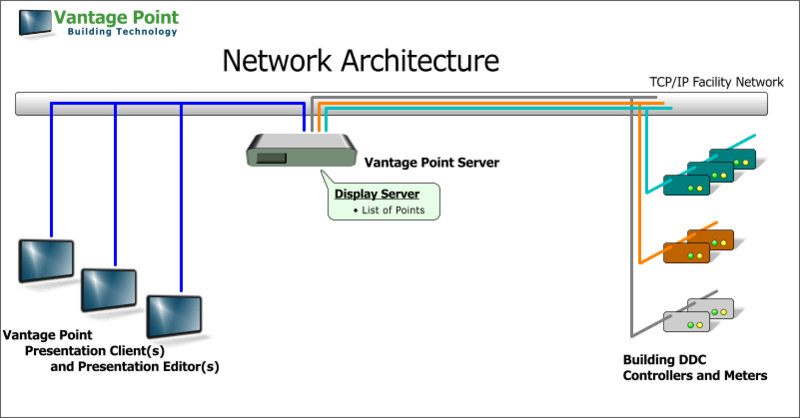 A Vantage Point Presentation retrieves information from the Vantage Point Server and shows it in a slideshow presentation. The Vantage Point Designer creates and modifies Presentations.